The snow continued to fall through the night, and the kids woke up anxious to play outside, this morning. The younger girls had to wait for their hair to dry, before they could go out. So, I distracted them with a few of our favorite Gingerbread Man stories. Then, I gave them a couple of gingerbread men puppets, to decorate. I made them, by cutting the gingerbread men shapes, with elongated legs, out of an empty cereal box. We stapled small loops of paper, to the back of each leg, just big enough for the girls to stick their fingers through. Then, we creased the legs, to make them bend better. ...until one came to the river, where helpful fox, offered him a ride across. Find out what other families are reading, at this week's What My Child is Reading blog hop, hosted by Mouse Grows, Mouse Learns. So cute. We have made cardboard gingerbread men before, but I never thought of putting the loops on the back for fingers - brilliant! C's kindergarten teacher lived in Hawaii (her husband is Hawaiian) and she read this book to the class last year. It's a fun read. There is also a Hawaiian Three Little Pigs that we had fun with: http://www.amazon.com/Three-Little-Hawaiian-Magic-Shark/dp/0940350254. Both books were great when we were studying Hawaii. It's fun to compare and contrast. No snow here yet. Just rain. But I'm sure it will be here soon. By this time in Nov. we usually have received snow to cover the ground. I love the puppet. 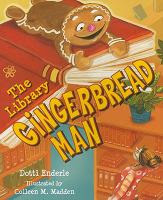 I have never heard of some of the gingerbread books before. 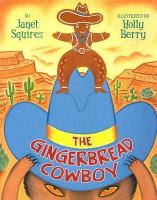 Love the picture of the girls playing out the story - you definitely have your gingerbread time perfected. We read Gingerbread Girl in the bookstore yesterday, and Anna was happy that the girl "will have a long life and not a short one like her stupid brother". PS - I cannot believe how much snow you already have. Meanwhile, here in Texas it's 73 degrees at 10:30 p.m. I hope it snows at least once this winter. 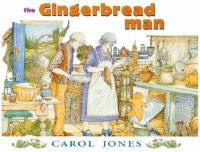 What a great selection of gingerbread books. 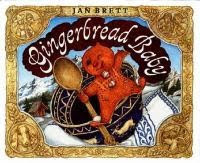 I love Gingerbread Baby by Jan Brett. I love all of her stuff. Cute craft, we're going to try that one.